Sheryl Lynn Callister is the founder of The Sheryl Lynn Foundation (SLF). With a main focus on children and education, SLF has since it was was founded in 2007 actively helped and supported Filipinos in poverty. 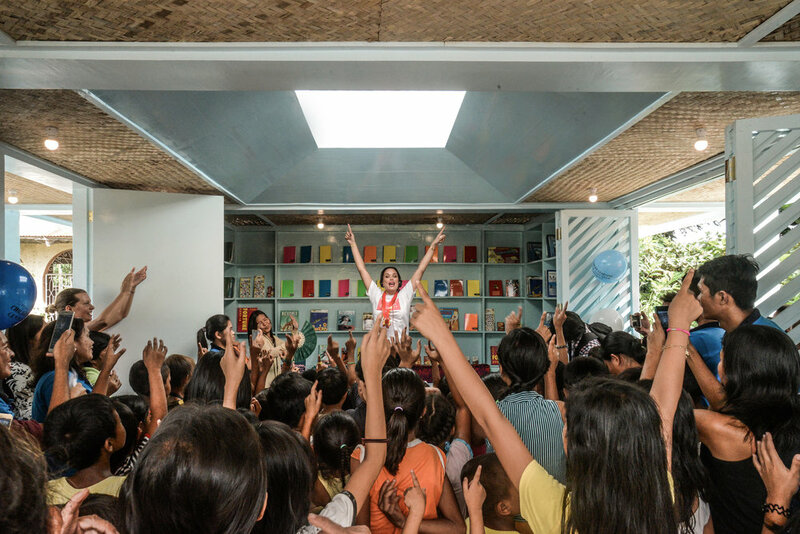 The first Native Narrative designed learning center was a project initiated by the Sheryl Lynn Foundation in collaboration with Rural Development Initiatives (local NGO) in Leyte who commissioned Native Narrative as the lead Design & Project Management consultant on a non-profit basis. Being a daughter of a Filipino mother and a Dutch father, the people & culture of the Philippines has always been a great part Sheryl Lynn's life. 21 million people lives under the national poverty line in the Phillippines (Source: Asian Development Bank), seeing the poverty in the Philippines with her own eyes during family visits as a little girl made a strong impact on her. She always hoped that one day she could find a way to make a significant impact for those who live in poverty. Realising this dream came closer when she was crowned Miss Netherlands in 2006, as this title gave her the opportunity to start her own foundation. Beauty competitions are extremely popular in the Philippines and the voice of the winner has the opportunity to reach a large audience. Over the years Sheryl-Lynn has used her extended work in entertainment as a platform for her foundation. A successful hosting & modelling career, winning the Mrs. Globe 2013 pageant in the United States and currently performing as an international DJ, all brings awareness to the foundation and ultimately creates funding for new projects. Sheryl Lynn furthermore graduated with honours in Cultural Anthropology and Development Sociology at Leiden University, a study she consciously chose as an investment for the Sheryl Lynn Foundation. She specialised in Environment & Development in the region of South-East Asia and did her fieldwork in the Philippines in the provinces of Leyte and Isabela. SLF collaborated with Leiden University to raise funds for the victims of super-typhoon Haiyan, after which Sheryl Lynn left to the disaster area in Leyte to help in relief and rehabilitation efforts. Leiden University nominated Sheryl Lynn as their representative for the national ECHO Award competition after her return from Leyte to the Netherlands. In 2014 she was awarded the ECHO Award for combining the world of entertainment, academics and philanthropy to use the outcome for a greater purpose; a formula & vision Sheryl-Lyn continues to carry out today. Photos: Sheryl Lynn DJ-ing for the kids, teenagers and parents in the village Cagbuhangin during the opening ceremony of the first Native Narrative designed Learning Center.